Guests love the fact that there are only two tents in a beautiful meadow with stunning views, so the peace and tranquility is something very special. The views will rejuvenate you with their sheer beauty and inside the tent everything is provided for a truly relaxing holiday. Children can play happily in the meadow or adjoining wood while the adults watch the sunset on the platform. Once the sun sets a BBQ is provided and a campfire pit for toasting marshmallows. This is definitely the place to unwind and enjoy the natural environment. For latest availability and best prices for Brocklands Farm, please use the Date Search above. 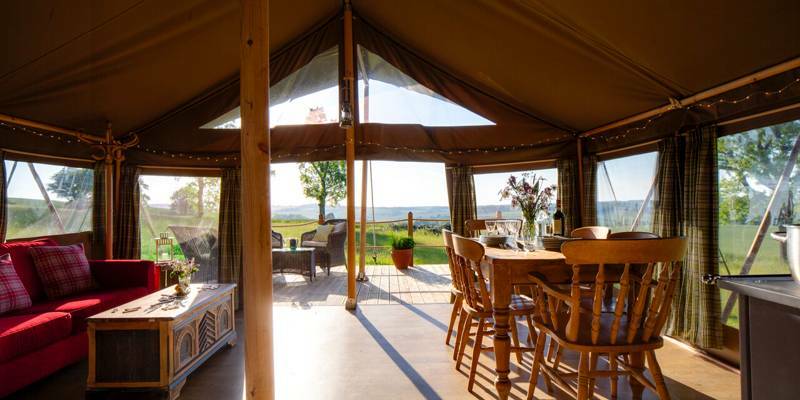 The tents have a king bedroom, double bedroom and a double cabin-bed with pure cotton bed linen, hot water bottles and towels provided. The kitchen is well-equipped and stocked with basics so that you don't have to bring them. A wood-burning range keeps the tent cosy and also acts as your stove. A gas ring is provided for a quick cup of tea. In the light and spacious living area there's a sofa, table and chairs with a trunk of games and suggestions for off-site visits and activities. Off-grid cosy lighting with paraffin lamps, candles and solar-powered fairy lights ensures that the atmosphere is extra special and encourages everyone to relax, chat and play games together. At the back of the tent the bathroom cabin with compost loo, basin and shower is spacious and extremely civilised. Eco-toiletries are included. Hot water is provided by a dedicated wood burner which also warms the whole cabin. Our fun Tentsile tree tent which sleeps 2 is available for hire with Yellowhammer. Outside on the deck is the perfect place to relax in the evening - a BBQ and firepit are provided outside and there is a rope swing for children. For many people one of the best things about our tents is the ability to walk in beautiful countryside straight from them. The South Downs Way is accessible from the top of the farm and there are grass tracks round most of the farm's fields. Further afield there is an interesting range of places to visit. Best known for its elegant garden, Hinton Ampner (01962 771305) is a wonderful country house with a collection of furniture, paintings and objets d'art. The five hectare site is widely acknowledged as a masterpiece of 20th century design, with highlights including the dell, a sunken garden and the recently restored walled garden. The fascinating maritime heritage at Portsmouth demands a day trip. Here you can wander around HMS Victory, Warrior and the Mary Rose at Portsmouth’s Historic dockyards (023 9283 9766), as well visiting the impressive Royal Navy Submarine Museum (023 9251 0354). The city’s 'Point District' lures tourists with cobbled streets and welcoming pubs, whilst the Spinnaker Tower (023 9285 7520) delivers fabulous coastal views. There is a wide range of habitats on show at the Old Winchester Hill National Nature Reserve. Butterflies can be seen in significant numbers on the hill during the summer months, whilst the reserve's woodland is home to dormice, badgers and deer. Dogs must be kept on a lead at all times. You can pre-order BBQ packs directly from the site as well as pre-ordering a selection of freshly cooked meals. The award-winning Harriotts butchers (01730 829246), who were named as a finalist in the ‘Butcher of the Year’ awards are nearby. West Meon has a Village Shop (01730 829310), providing everyday groceries and local produce. Cuppacheeno Café (07920 427776) is well renowned for being a pit-stop for walkers and cyclists, with a choice of protein packed breakfasts, vitamin fuelled smoothies and excellent coffee, roasted in Winchester! The Winchester Farmers Market can claim to be one of the largest in the country. 80+ producers attend this twice monthly market selling many meats, cheese, milk, cream, honey, breads, and fresh smoked fish. Delicious meals can be found at The Thomas Lord (within walking distance in West Meon), The Shoe at Exton (good for a lunch stop on a long walk as well as an evening meal) and Ye Olde George in East Meon. From J9 of the M3: at Winchester follow signs for Petersfield onto the A272. After approximately 9 miles, turn right onto the A32. Head into the village of West Meon and after you have gone through the double bends, on a sharp right hand bend, take a left turn into Station Road. Detailed instructions for finding the site from here will be given upon booking. Nearest train stations: Petersfield, Alton and Winchester. Regular but infrequent buses from all three to West Meon. 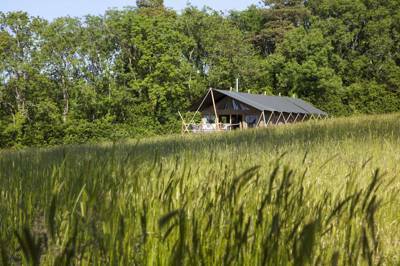 Sleeping 6 comfortably, the safari tents sits amongst a 2 ½ acre grass meadow.